"Every Thursday" will feature people of creativity and/or ideals of leadership throughout their work. There's a lot of good and bad propaganda being thrown out these days, and the intelligence of the American people has become extremely sensitive to negative rhetoric. Since the Bush Administration, Americans are paying more attention to the political policy than ever before. America has witnessed and felt war, foreclosures and unemployment. Hardships and difficulties are touching people, who normally would not have felt these anxieties. First Lady Michelle Obama, delivered an excellent talk, at the 2012 Democratic National Convention #DNC in Charlotte, North Carolina. A speech of Motivation and Encouragement Americans needed to hear. 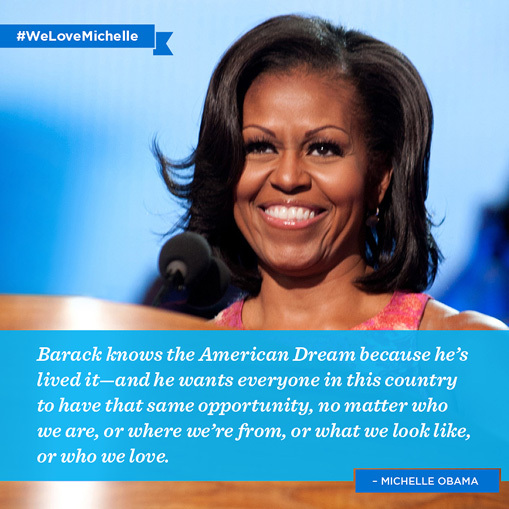 Mrs. Obama acknowledged, they have felt the same struggles as people face daily. Giving a worried nation a sense of security and comfort. Mrs. Obama reached America's intelligence chamber with sincerity, during a very critical time of needing assurance. The Creator Knows Best of America's future and we pray for the best. Thank you First Lady for being a good example for many people to follow, Major respect and we Salute you!